Welcome back to another week of What I'm Wearing, where the staff of Wareable show off the wearables and accessories are adorning our wrist at the moment. You see, our wrists tend to be revolving doors for smartwatches, fitness trackers, straps and more. So before we put them through their paces for our reviews, we'd like to give you a sneak peek at what's next on our lists. Plus, we just really like talking about wearables. We're always on the lookout for more, too, so if you've got any recommendations then hit us up at [email protected]. Perhaps they'll make an appearance during the next edition of What I'm Wearing. I really wish it wasn't the case that 90% of sports watches make me feel like I'm wearing an electronic tag. The Amazfit Stratos, the wearable on my wrist this week, doesn't deviate from that unfortunate trend; it's about the size of the Fenix 5, though it also feels lighter. Reduced weight for good behaviour. 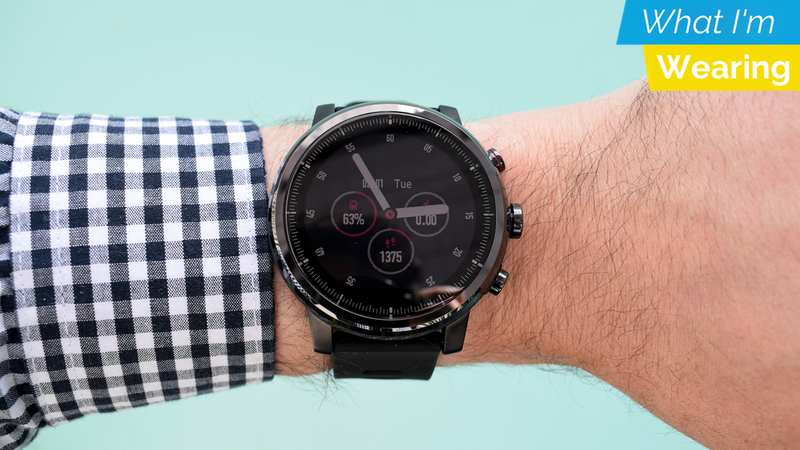 What's impressive here is that, at $200, it's a little over a third of the price of its Garmin rival while offering many of the same features: multi-sport tracking, heart rate, built-in GPS and up to five days of battery life. I'm going to be putting it to the test over the coming days, but it's got a lot to prove in going up against established names like Garmin and Polar. The display is… not great, but some of the cosmetic concerns may fade away if this thing can prove its value in features. Can it go toe-to-toe with the giants at just $200? We'll be sure to let you know. I really cannot get enough of nylon bands. There's something about how rugged they are that makes me feel like I'm ready to hike up a mountain at a moment's notice. And if you too are looking for one of the more rugged nylon bands out there, then Southern Straps is a good option. The band is doubled over for extra durability. While that makes it extra stiff at first, once it gets used to your wrist it's actually quite comfortable, with none of that itch you get on some poor quality nylon bands. I'm a bigger fan of the metal latches and loops though. They have a real industrial feeling to them, one that's dangerously close to bringing out my inner blacksmith.